Browse: Home / 2018 / July / 28 / IS SOUTH CHINA SEA GOING GOING GONE INTO CHINA’S LAP? TIME IS RUNNING OUT TO MAKE CHINA ADHERE TO UNCLOS (1982) WHICH USA HAS ITSELF NOT SIGNED! LESSONS IN THESE INTERESTING TIMES AS INDIA PAKISTAN CHINA & BHUTAN TOO HAVE NO DEFINED BOUNDARIES! This IDF post is a maritime analysis inquiring of the state of current sovereignty of the Parcels near Vietnam, and Spratly Islands near Philippines, called the South China Sea (SCS). Three other nations have lesser claims. With superior reclamation technology China has rocks turned in to fortified Islands in the SCS and opened them to tourism, fishing and exploration from Hainan and Haikou. SCS has gas and oil called the Blue Economy. China has dipped in to its deep pockets, and guards the SCS with its rising PLA (Navy) and taken over the Coast Guard. New laws for base sea boundary lines extending to islands were introduced in UNCLOS and China set up three full Maritime Universities at Dalian, Shanghai and Jiangsu for Maritime Law and to study SCS. Many claim Bangla Desh and Myanmar consulted Chinese experts in their claims which concerned India and it helped. Even Pakistan did, to further its claims for extended EEZ in UN’s Commission on the Limits of the Continental Shelf. Pakistan was the 13th nation to stake its EEZ claim as having deeper waters than India, and has got a favorable resolution which will have significant strategic consequences. India took time to submit its claims to be heard in sequence for final dispensation. On SCS in the ITLOS arbitration, China issued a Non Paper purposely in poor English to confuse, in its defence. Philippines claimed the Spratlys citing Jurisdiction and won in 2016. Taiwan which has the original Chinese 8 Dash Line Chart it is rumored, owns the largest island called Taiping (Ibu Itu) in the SCS was not allowed to put forth its claim, or even attend proceedings not being a member of UN. Its Press Statement in 2016 needs study. China has refused to accept the 2016 ITLOS verdict from Hamburg. It ratifies the dictum that in foreign policy morality rests with the powerful. USA took over New Mexico, kept Red Indians in reservations, Britain held Hong Kong, Pakistan took over Baluchistan in 1948, China took over Tibet in 1959, India took over Goa in 1961 and more recently Russia took over Crimea. India’s move to Sikkim and India’s move to break Pakistan into two in 1971 was again in National interests. It shows ‘Power Talks’ in justified cases and that needs economic and military power. China has economic power and is building military power which worries President Trump and India too, with China’s truck with Pakistan. 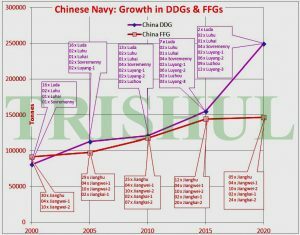 China has a large expanding Navy to patrol the SCS and even sailed it’s 70,000 ton aircraft carrier Liaoning with homemade J-15 jets, which have had two fatal accidents as too heavy, and exercised in the SCS waters, and shoos away the US and Philippines Navy ships if they enter the SCS rocks claiming them as sovereign territorial waters of 12 nautical miles as per UNCLOS, (One NM is 2000 yards). J-15s are being replaced by J-31s when ready and second carrier homemade Shandong is getting ready to patrol further with submarines. China claims SCS with a heritage clause on a grandfathered 8 Dash Line which chart it is said to be with Taiwan and China misquotes UNCLOS 15 quoted below and wants mutual delineation with nations in the dispute and asks USA and others to stay clear. Note the word Historic ! Power talks. No one wants war in nuclear times, so a trade war is being attempted. The US Navy regularly sends a medium warship and a plane to make a passage in the 12 nautical mile limit in SCS as innocent passage allowed by UNLOS but China wants to limit Article 17 of innocent passage to White (merchant) shipping only, not warships to show sovereignty. US Chief of Naval Operations (CNO) Adm John Richardson has warned, the powerful US military is facing rising competition from Peer and near Peer nations. The CNO’s message, was conveyed by the Senior most Sailor, a practice USN follows. 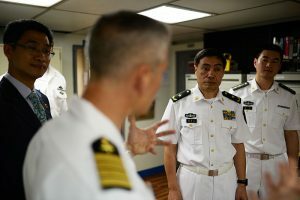 “ if you haven’t heard it or don’t understand it, means that there are navies out there that have very capable ships, submarines and aircraft that can hurt USA so the kind of warfare we need to start preparing for is very different than the kind we’ve faced over the past 17 years — we’re likely to face maritime threats in the future the likes of which we haven’t faced since World War II.” The bottom line as trade war rages between China and USA is clear to IDF; Prepare yourselves and your sailors now, because all of your future depends on it. China participated in the 2014 and 2016 RIMPAC with four ships and another spy ship with Indian and 25 Navies and gained a lot of experience. It was Def Sec Ash Carter who had invited PLA(N) to join despite tensions at the time in SCS, with countries like India and Vietnam and said, “that we don’t have decades of experience with India , like the Philippines; they’re all coming to us, in part because they’re concerned about China.” RIMPAC has back fired and QUAD has formed! 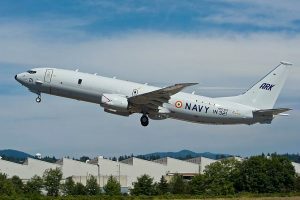 Indian Navy fielded MSDL built INS Sahyadri and a P8i off Hawaii. 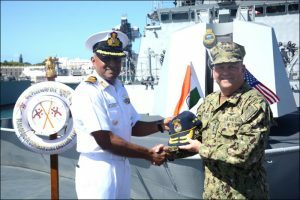 Vadm John Alexander, CTF RIMPAC 18 visited INS Sahyadri at Pearl Harbour on 27 June 2018.. The lesson for India is power talks. 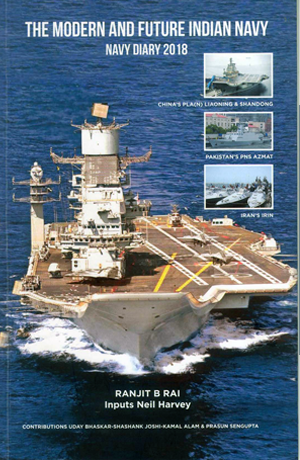 Indian experts claim Indian Navy has more capability than the PLA Navy which has only capacity. IDF met and questioned maritime friend Tai Meung expert from San Diego who follows PLA (N) who was in Delhi and gave talks to think tanks about the two navies. 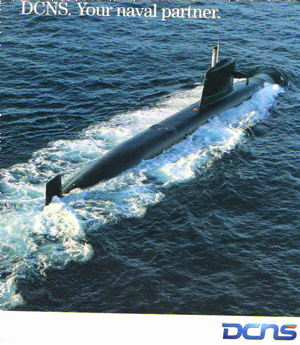 He spoke like the CNO, “ PLA(N) now has capacity and capability, but lacks experience which Indian Navy has”. On TAIPING claim by Taiwan which could one day help China if Taiwan joined China in ITLOS, he said the JURY IS OUT for a re-look. 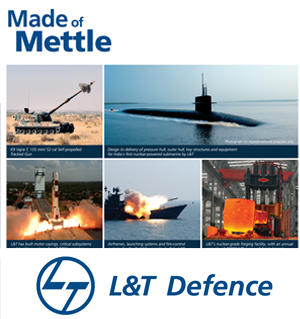 There are lessons for India’s maritime power needs. In Hindi it is said, “ JIS KE LATHI USKE BHAINS” ….The cow belongs to the man who has the stick. Shan Na Varuna.